• Homogeneous assay for cell viability, proliferation, cytotoxcity and high-throughput screen for anticancer agents. • Safe. Non-radioactive assay (cf. 3H-thymidine incorporation assay). • Sensitive and accurate. 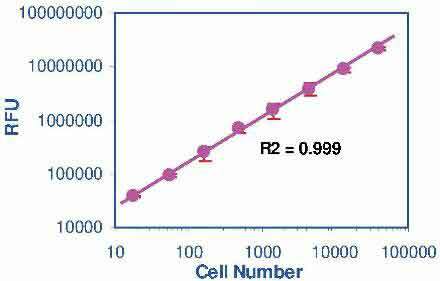 As low as 100 cells can be accurately quantified. • Time efficient. High-throughput assay in 96-well and 384-well plates allows simultaneous processing ten of thousands of samples per day. • Homogeneous and convenient. A single reagent and "mix-incubate-measure" type assay. No wash and reagent transfer steps are involved. • Robust and amenable to HTS. Z factors of 0.6 to 0.9 are routinely observed in 96-well and 384-well plates. Can be readily automated on HTS liquid handling systems. • This homogeneous assay involves simply adding a single reagent, the CellQuanti-Blue™ reagent, to the cell culture and measuring the fluorescence intensity (excitation wavelength = 530 - 570 nm, emission wavelength = 590 - 620 nm) after an incubation step. The CellQuanti-Blue™ reagent, like other resazurin-based assays such as the Alamar Blue reagent, utilizes the redox dye resazurin which is not fluorescent,but upon reduction by metabolically active cells is converted into a highly fluorescent product (resorufin). Living cells can readily reduce this non-toxic reagent and the resulting increase in fluorescence intensity can be conveniently monitored using a fluorescence spectrophotometer or plate reader. Nonviable cells have no metabolic capacity and, thus, will not reduce the dye. Therefore, the fluorescence intensity observed in this assay is a true measure of the viable cells. The CellQuanti-Blue™ reagent has been optimized for maximum sensitivity, reproducibility and long shelf-life. The homogeneous cell-based assay can be performed in multi-well plates. The reagent is compatible with all culture media and with all liquid handling systems for high-throughput screening applications in 96-well and 384-well plates. Applications include cell proliferation, cytotoxicity and apoptosis. 1. Which enzymatic reaction converts the resazurin into the fluoresence dye? The exact mechanism how resazurin is converted into the fluorescent resorufin is not known, but it is generally believed that resazurin enters the cell and is reduced by enzymes in the mitochondrial respiratory chain. As only living cells harbor active mitochondria, the conversion of this dye as measured by the fluorescence intensity of the product, is an accurate measure of mitochondria activity and hence living cells. 2. I have access to two plate readers: Molecular Devices Flexstation and Victor 3 Perkin Elmer. Do you have info on the optimal excitation and emission wavelength on these specific devices? Any excitation filter in the range of 530-570 nm combined with a suitable emission filter in the range of 585-620 nm for emission, will work. Because excitation and emission wavelengths are close together, we recommend the use of a cut-off filter, if available. 3. I am going to do the assay directly on the wells containing media and adherent cells. After the assay, I am interested to harvest the cells for IFA testing (recover of cells with trypsin digestion, then incubate with antibodies, then with FTIC-antibodies, finally viewing under the microscope. Does the dye in CQBL absorbed by the cells? Will it interfere with the IFA viewing under the microscope? Resazurin enters the cells and it is in the cells that it is reduced into the fluorescent dye. During the wash steps in the antibody staining procedure it will likely be completely removed from the cells. Even it that was not the case, FITC is typically measured at an emission wavelength of 525 nm, and the reduced form of resazurin does not fluoresce at wavelengths below 530 nm. So the assay should not interfere with the immunofluorescence staining. 1. Mochida, S et al (2007). Geranylgeranylacetone Ameliorates Inflammatory Response to Lipopolysaccharide (LPS) in Murine Macrophages: Inhibition of LPS Binding to The Cell Surface. J. Clin. Biochem. Nutr., 41, 115–123. Assay: Cell Viability in Mouse cell lines (Pubmed). 2. Desplats, PA et al (2008). Functional roles for the striatal-enriched transcription factor, Bcl11b, in the control of striatal gene expression and transcriptional dysregulation in Huntington’s disease. Neurobiol Dis. 31(3):298-308. Assay: Cell Viability in Human cells (Pubmed). 3. Vijaykumar, TS et al (2008). Chloroquine mediated molecular tuning of astrocytes for enhanced permissiveness to HIV infection. Virol. 381(1):1-5. Assay: Cell Viability in Human cells (Pubmed). 4. Zayas-Santiago A, Kang Derwent JJ (2009). Preservation of intact adult rat photoreceptors in vitro: study of dissociation techniques and the effect of light. Mol Vis.15:1-9. Assay: Cell Viability in Rat photoreceptor cells (Pubmed). 5. Heminger, K et al (2009). Alterations in gene expression and sensitivity to genotoxic stress following HdmX or Hdm2 knockdown in human tumor cells harboring wild-type p53. Aging 1(1):89-108. Assay: Cell Viability in Human cell lines (Pubmed). 6. Kelley, KD et al (2010). YPEL3, a p53-regulated gene that induces cellular senescence. Cancer Res. 70(9):3566-75. Assay: Cell Viability in Human U2OS-TetR cells (Pubmed). 7. Ramirez, CN et al (2010). Cell viability assessment: toward content-rich platforms. Expert Opinion on Drug Discovery 5(3): 223-233. Assay: Cell Viability in Human cell line (Pubmed). 8. Hemendinger, RA et al (2008). Huperzine A provides neuroprotection against several cell death inducers using in vitro model systems of motor neuron cell death. Neurotox Res. 13(1):49-61. Assay: Cell Viability in Rat cells (Pubmed). 9. Wang, T et al (2010). Activated T-cells inhibit neurogenesis by releasing granzyme B: rescue by Kv1.3 blockers. J Neurosci. 30(14):5020-7. Assay: Cell Viability in Human neural progenitor cells (Pubmed). 10. Hahn, A et al (2010). Therapeutic window for bioactive nanocomposites fabricated by laser ablation in polymer-doped organic liquids. Adv. Eng. Mater. 12(5). Assay: Cell Viability in Mouse cell lines (Pubmed). 11. Mitsui, R et al (2010). Maintenance of paracellular barrier function by insulin-like growth factor-I in submandibular gland cells. Arch Oral Biol. 55(12):963-9. Assay: Cell Viability in Rat cells (Pubmed). 12. Nakajima, Y et al (2009). Neuroprotective effects of Brazilian green propolis and its main constituents against oxygen-glucose deprivation stress, with a gene-expression analysis. Phytother Res. 23(10):1431-8. Assay: Cell Viability in Rat cell line (Pubmed). 13. Martino, CF et al (2010). Effects of weak static magnetic fields on endothelial cells. Bioelectromagnetics 31(4):296-301. Assay: Cell Viability in Human endothelial cells (Pubmed). 14. Hemendinger, RA et al (2011). Methyl Vitamin B12 but not methylfolate rescues a motor neuron-like cell line from homocysteine-mediated cell death. Toxicol Appl Pharmacol. 251(3):217-25. Assay: Cell Viability in Human cell lines (Pubmed). 15. Fujimoto, M et al (2011). Examination of Cell Viability using the primary culture system of skin fibroblasts. XXXXX. Assay: Cell Viability in Human fibroblasts (Pubmed). 16. Ibrihim, MIM et al (2014). Aqueous extract of Corchorus olitorius decreases cytotoxicity of aflatoxin B atoxin B1and fumonisin B and fumonisin B1 in H4IIE- in H4IIE-luccells.Hepatoma Research. 1(2).